We've all been there: a stomach full of potatoes, a heart warmed by potatoes, and yet, you've still got a full bag of potatoes. Luckily, when you're sick of eating them, potatoes have about 4 million other uses. Here are my fav five. Did you know that you can pay some random dudes on the internet to mail your friend a potato? The business, Mail a Spud, takes your $10 and does something magical: sends a potato through the mail. In the "Why a potato?" portion of the FAQ, the business owners respond: "Why the hell not?" Amen. No, I'm not throwing it back to elementary school science fair days — I'm going way further back in history. The ancient Incans used the time it took to cook a potato as a unit of measurement, and I think we should do the same. Honestly, I can think of no better way to spend a few potato bakes than deviating from the metric system a little bit. Generally, do not be like Marie Antoinette — unless you find her potato-inspired looks apeeling. 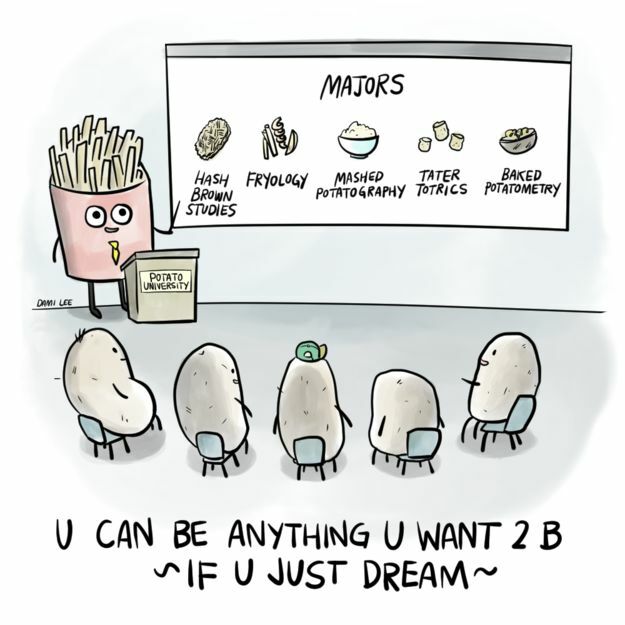 (That's a classic potato pun, not a spelling error. Don't @ me.) Back in the day, French scientist Antoine-Augustin Parmentier wanted everyone in France to eat potatoes because he lived off them in Prussian prison for three years. To make that happen, he threw King Louis XVI a potato-themed birthday party and got the king and queen to love potatoes almost as much as he did. Marie Antoinette even wore potato flowers in her hair to show support. If you've got some spare time and a pressure cooker, you can make some plastic using the starch in potatoes. The whole process seems complicated, but some 14-year-old on the internet made an instructable for people at home, so you, too, can make your own plastic utensils. The 14-year-old warns, "First off this is possible to accomplish without being injured if done properly, however I assume no responsibility for you're [sic] mistakes and lapses in judgment." Here's an idea: take photos of potatoes and then use the potatoes to develop the photos. That's not exactly how autochrome works, but kind of. In 1907, the Lumière brothers discovered the key to viable color photography: potato starch. According to NatGeo, their process, autochrome, "involved covering a glass plate with a thin wash of tiny potato starch grains dyed red, green, and blue, thus creating a filter. A thin layer of emulsion was added over that. When the plate was flipped and exposed to light, the resulting image could be developed into a transparency." Boom. Science. The next time you have a sack of potatoes and a couple potato bakes of free time, consider both the edible and inedible versatility of the potato. It can be anything you want it to be.